In the late winter of last year we noticed an uptick in what appeared to be firefighters coming in to use the infrared sauna. 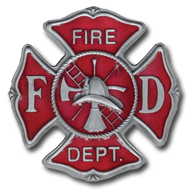 No, they were not coming in dressed in full firefighter gear, but rather many a blue or gray shirt with the St. Florian ‘fire fighters emblem’ on their breast. “The fire departments in Louisville and Indianapolis are encouraging us firefighters to sit in infrared sauna after we go into burning buildings. It’s because a lot of us get cancer, and this stuff (the sauna) is supposed to be good at detoxing”. “A study by researchers from (NIOSH), the NCI, and the UC Davis Department of Public Health Sciences, completed a five-year study in 2015 of nearly 30,000 firefighters from Chicago, Philadelphia and San Francisco and concluded that firefighters in the study had a greater number of cancer diagnoses and cancer-related deaths. Those statistics are pretty eye opening, but why infrared sauna? (We have a lot of info on sauna under our ‘sauna page’ on our website, so feel free to check that out.). Infrared Sauna uses a low-frequency light (invisible to the human eye) that is able to penetrate into the body’s muscle tissue up to 1.5” deep. The penetrating infrared light heats your body by stimulating blood flow to deep tissue and agitating water molecules in the body, creating a better, more effective, ‘deep’ sweat. The sweat from an IR sauna has shown to be more concentrated with heavy metals, chemicals, and toxins. The sauna’s heat maxes out at 140º, which is significantly cooler a temperature than a normal ‘dry heat sauna’ or ‘steam sauna’, but since the infrared light is able to penetrate your body more effectively your body heats up quicker and with less discomfort both during and after the sauna. During a regular Infrared Sauna session at Weightless Float Center it is not uncommon for users to burn 500+ calories in 40min. of just sitting there…if you do some isolated flexing or stretches you’re guaranteed to burn a lot more, plus, the 20-30min of cool-down after your session will likely burn another 200+ calories. Thats almost 1,000 calories in an hour of just SITTING. If you were going to run that on a treadmill you’d be running for 5hrs! As the cooler temperatures descend upon us in Kentucky I look forward to the chilly days, knowing that Louisville has access to infrared sauna that will keep our cores warm in the coldest of months while at the same time providing incredible health benefits for both body and mind. We look forward to seeing you at Weightless Float Center (@Weightlessky) for a float, massage, or infrared sauna.